For some dogs, winter is the worst time of year for dry skin. When you think about it, most people have more issues with dry skin during the winter months than they do in other times of the year. Winter skin irritation can be quite common, especially if you live in an area where there are cold temperatures, low humidity, snow, and ice. Your local Southeastern Massachusetts veterinarian can provide you with seasonal pet tips at your next veterinary check-up. However, if you feel that your dog’s dry skin warrants a special trip to the Dartmouth vet hospital, give us a call right away to make an appointment. You might not expect winter to be such a dry season for your dog’s skin, but there are some factors that contribute to this phenomenon. 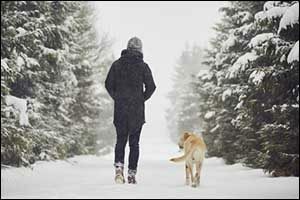 Outdoor winter weather can leave paws flaky, irritated, and even raw. Excessive grooming and scratching can be a sign that your dog’s skin is dry as well. There are a number of reasons for itchy, dry skin, including exposure to winter weather, low humidity indoors due to heaters and lack of fresh air, as well as your dog’s response to the cold weather. Seasonal tips often include protecting your dog’s feet from snow, ice, and de-icing chemicals, which can really damage their pads and the sensitive skin between their toes. Parasitic infections, skin allergies, and immune response to the environment are some other common causes of winter skin irritations. If the simple things that you do at home to prevent dry skin or help to overcome it do not help, consider bringing your pet for a veterinary check-up. Your local Southeastern Massachusetts veterinarian has lots of experience in this area and can help make a noticeable improvement in your dog’s health. Since most dogs need to go outdoors several times each day, simply avoiding the weather is not possible. In addition to dry skin, the lower humidity found in homes this time of year can also contribute to upper respiratory problems as well. If your dog goes outdoors frequently in the winter and still enjoys his daily walk, contact dermatitis might be the cause of dry, irritated, and even inflamed skin. When direct contact is made with a substance that causes irritation, it can lead to a condition known as contact dermatitis. The biggest culprit in Massachusetts is salt and other de-icing chemicals, which are used to clear driveways, walkways, and streets. Even if you do not use it yourself, a quick walk around the block can expose your dog to it several times. However, it’s not just outdoors substances that can lead to irritation. Even the fibers in carpet, blankets, and furniture can lead to contact dermatitis. So if your dog is spending more time indoors during the winter, the indoor irritants could be causing him to have problems. While most people think that parasites are only a fair weather problem, the truth is that fleas, mites, and other parasites can still bother your dog in the winter. They don’t just die off when it gets cold and, if left untreated, they can spread to other animals and even human members of your household. Some dogs are even allergic to fleas, so as long as there are fleas present in your home, they could be afflicted. We can provide you with a variety of solutions designed to work for your problem. Some parasites can lead to skin infections and even internal issues. Fungal infections can also be a problem, such as yeast or ringworm infections, which can also occur year-round. If you suspect a parasitic infestation or an infection of any kind, bring your pet to our Dartmouth vet hospital for a check-up. If you bring your dog in for a veterinary check-up, make sure to provide your vet team with all of the information they need to diagnose and treat your pet properly. If you have made any changes in your pet’s environment, such as new shampoos, fabric softeners for blankets, bedding, or have brought home a new pet, speak up. If your pet has been exposed to any chemicals, plants, or has eaten food that he doesn’t normally eat, say something. Your veterinary exam at our Dartmouth vet hospital will begin with a physical exam of your dog’s skin and coat. Additionally, some tests may be run if infections, parasites, or other conditions are suspected to be causing the dry skin and irritation symptoms. Give us a call at 508-996-3731 to schedule an appointment or to speak with a Southeastern Massachusetts veterinarian on staff. Anchor Animal Hospital has served the South Coast region since 1975 and provides a wide range of services, including emergency veterinary services, dentistry, nutrition, and parasite prevention and control.